After the Freedom Rides of 1961 led to integration of interstate buses and terminals, the Civil Rights Movement moved on to “Freedom Highways” in 1962—campaigning to end segregation at establishments that served the traveling public. The Howard Johnson’s restaurant on Chapel Hill Boulevard became a focal point in Durham. On Sunday, August 12, 1962, more than 500 people attended a “Freedom Rally” at St. Joseph’s AME Church. Durham attorney Floyd McKissick, a veteran of years of activism against Jim Crow, was master of ceremonies. He was joined by two of the movement’s national leaders, Roy Wilkins, executive director of the National Association for the Advancement of Colored People, and James Farmer, national director of the Congress of Racial Equality. 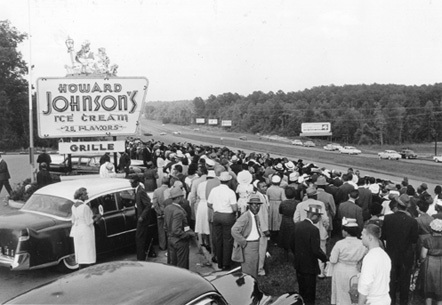 From the church, the crowd caravanned to Howard Johnson’s parking lot, where they demonstrated with song and prayer against the restaurant’s segregation policy and against the trespassing convictions of four members of an earlier protest there. The group was a cross-section of Durham’s African-American community—from attorneys to North Carolina Mutual employees and North Carolina College (now North Carolina Central University) leaders, to clerks, factory workers, teachers, housewives, and students gathered in what one observer called “one of the greatest displays of racial unity” in the city. The demonstration ended without incident and would be repeated, Sunday after Sunday, for nearly a year.